The 37.75 metre motor Hakuna Matata, listed for sale by Kirill Anissimov and Dennis Frederiksen at Fraser, has been sold with the buyer introduced by Pedro Millet at Viudes Yachts. 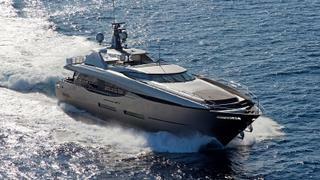 Built in GRP by Turkish yard Peri Yachts to RINA class, she was designed by Dixon Yacht Design and launched in 2011. MCA compliant, she has a lavish interior by Scaro Design accommodating 12 guests in five staterooms. The master suite has a private study and there are two full beam VIP staterooms plus two doubles, each with a Pullman berth. All staterooms have television sets, marble floors and en suite bathroom facilities. The sun deck makes an excellent area for outdoor life with a dining table, large sun bed, a Jacuzzi for four and a fold down television set. The aft deck cockpit and flybridge also have television screens for al fresco entertainment. Twin 2,185hp MTU engines give her a range of 1,850 nautical miles and she is fitted with Trac zero speed stabilisers. Always privately used by her previous owner, Hakuna Matata was asking €4,500,000.